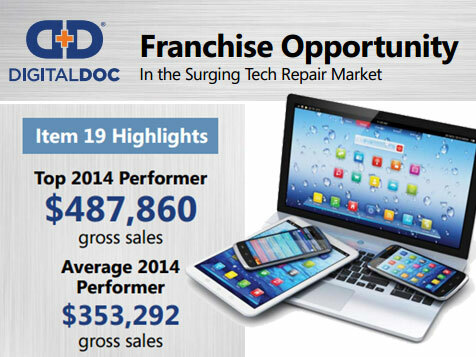 What does a Digital Doc Repair Franchise Cost? 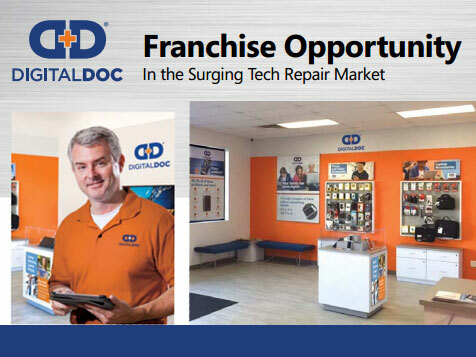 Become a Digital Doc Franchise Owner! Get your share of the $1.5 Billion device repair industry. With over 4.9 Billion Internet connected devices today and over 25 Billion connected devices expected by 2020, the digital device repair business is a solid investment. Add to that Digital Doc’s focus on becoming a trusted digital solution provider offering device sales, restoration, and education and you have a recipe for high growth as well as an edge on brands focusing primarily on repairs. Would you like to know more? For additional information regarding Digital Doc franchise opportunities, please complete an inquiry form today. Open Digital Doc Repair in any of these available states: AL, AK, AZ, AR, CA, CO, CT, DE, FL, GA, HI, ID, IN, IA, KS, KY, LA, ME, MA, MI, MN, MS, MO, MT, NE, NV, NH, NJ, NM, NY, NC, ND, OH, OK, OR, PA, RI, SC, SD, TN, TX, UT, VT, VA, WA, WV, WI, WY, DC. Digital Doc has proven to be something of a phenomenon. The original store in Owensboro, Kentucky, took off like wildfire. We began offering franchise opportunities in January 2013, and by the end of that year had 10 franchisees with more on the way! A large part of our success is our passion for innovation and service; our technicians love helping our clients learn and understand how the latest products can help make their lives convenient and enjoyable. In 2014, the top franchise performer grossed $487,860 in sales and the average performer grossed $353,292 in sales. Please refer to the Digital Doc Franchise Disclosure Document for more details about how much you can make as a Digital Doc franchise owner. You do not have to be an expert technician to run a technical business expertly. We provide upfront and ongoing training along with certification programs to ensure Digital Doc is a market leader in quality repairs and customer satisfaction. Leverage the purchasing power of Digital Doc to drive deep discounts on quality parts through our exclusive vendor relationships. Gain weekly insight into the latest trends on availability and pricing of parts. Digital Doc Franchisees enjoy priority order fulfillment with multiple distributors. 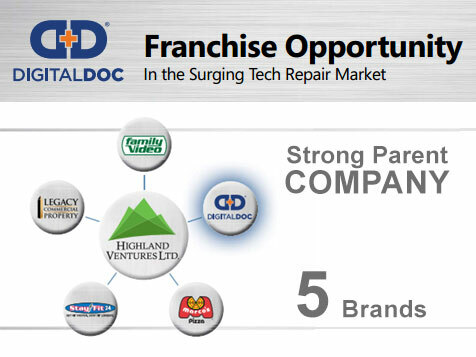 Digital Doc is one of five brands owned and operated by Highland Ventures Ltd. Highland Ventures Ltd. is a privately held, family business in continuous operation since 1946. Highland Ventures Ltd. owns over 700 commercial real estate properties and operates over 900 retail locations across its five brands. Join the Digital Doc Revolution.